Animals host a wide diversity of symbiotic microorganisms that contribute important functions to host health, and our knowledge of what drives variation in the composition of these complex communities continues to grow. Microbiome studies at larger spatial scales present opportunities to evaluate the contribution of large-scale factors to variation in the microbiome. We conducted a large-scale field study to assess variation in the bacterial symbiont communities on adult frog skin (Pseudacris crucifer), characterized using 16S rRNA gene amplicon sequencing. We found that skin bacterial communities on frogs were less diverse than, and structurally distinct from, the surrounding habitat. Frog skin was typically dominated by one of two bacterial OTUs: at western sites, a Proteobacteria dominated the community, whereas eastern sites were dominated by an Actinobacteria. 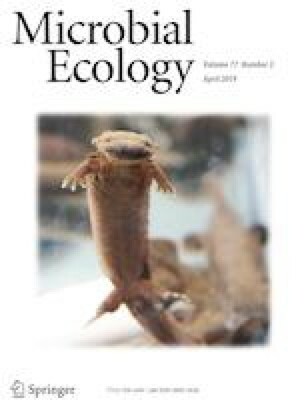 Using a metacommunity framework, we then sought to identify factors explaining small- and large-scale variation in community structure—that is, among hosts within a pond, and among ponds spanning the study transect. We focused on the presence of a fungal skin pathogen, Batrachochytrium dendrobatidis (Bd) as one potential driver of variation. We found no direct link between skin bacterial community structure and Bd infection status of individual frog hosts. Differences in pond-level community structure, however, were explained by Bd infection prevalence. Importantly, Bd infection prevalence itself was correlated with numerous other environmental factors; thus, skin bacterial diversity may be influenced by a complex suite of extrinsic factors. Our findings indicate that large-scale factors and processes merit consideration when seeking to understand microbiome diversity. The online version of this article ( https://doi.org/10.1007/s00248-019-01372-0) contains supplementary material, which is available to authorized users. We thank P. Shirk, J. Vonesh, J. Wyderko, and S. Zemmer for assistance in the field; P. Sattler at Liberty University, G. Eaton at Claytor Nature Study Center, and J. Vonesh at Virginia Commonwealth University for recommending sites in Lynchburg, Bedford, and Richmond, respectively; J. Touchon for R code consultations; C. Herbold for stats advice; and Z. Herbert at the Dana Farber Cancer Institute Molecular Biology Core Facility for Illumina MiSeq amplicon sequencing. We are also thankful for the comments of anonymous reviewers that improved the manuscript. This work was supported by the Morris Animal Foundation [D10ZO-028] and the National Science Foundation [DEB-1136640]. This research was conducted with approval from Virginia Tech’s Institutional Animal Care and Use Committee (protocol 10-029-BIOL) and with permission from the Virginia Department of Game and Inland Fisheries (permit 44303).